The input to the algorithm is a bipartite directed graph $G'=(V,E)$ with all edges directed from $L$ to $R$ (where $V=L\cup R$) and no repeated edges. 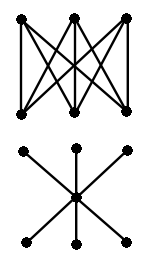 In particular, the output of the algorithm should be the minimal-edge-count graph among the set of all graphs that satisfy the above conditions. Roughly speaking: given a directed bipartite graph, we want to find another directed graph that's "reachability-equivalent" in some sense and that has the fewest number of edges possible. Question: is there an efficient algorithm for this task? This is like finding a transitive reduction (or minimum equivalent graph) of a particular kind of dag, but where we're allowed to add additional vertices. Browse other questions tagged algorithms graphs optimization or ask your own question. Is the weighted transitive reduction problem NP-hard? How to correctly contract an edge in a network? Edge removal to convert a non-planar DAG to a planar DAG while maintaining reachability?